Nice, every day kind of watch. Smaller face than I expected but still looked very nice. I gave it 4 stars because even on the smallest notch, it was too large-- if you have small-ish wrists, this one may not work for you! 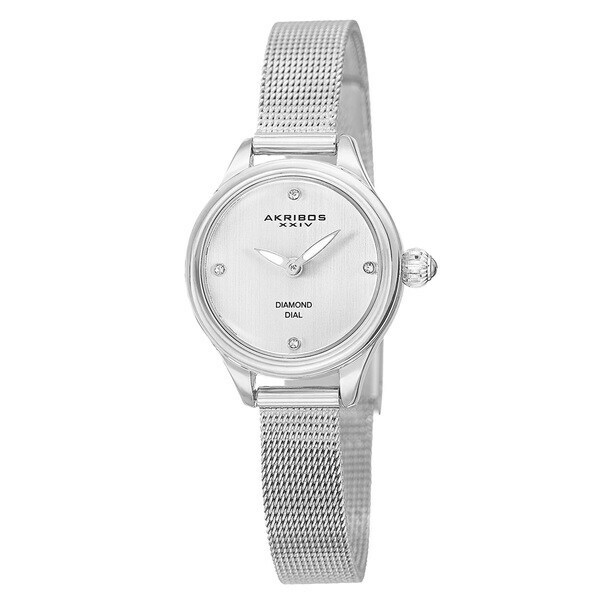 This elegant Akribos XXIV women's watch has a durable stainless steel bracelet and luminous leaf style hands. It features a clean dial with four sparkling genuine diamond markers. Whether at work or party, this beautiful watch will enhance your attire. I love the look of this watch. However, you should be aware that if you want to adjust the length of the metal strap, you have to take it to a jewelers (which cost me $10) as there's no way to adjust it without a special tool. I needed it to be much smaller to fit my small wrist and now that it fits, I love it. I deducted a star because it has to be adjusted by a jeweler (and there was no info included about this).